Original owner, non-smoking, no pets, excellent condition. Gently driven and lovingly cared for. 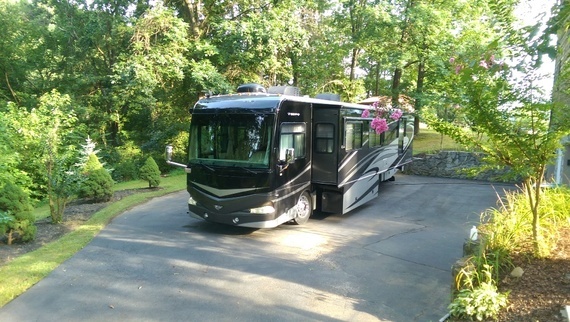 Features: Full Wall Slide, Outside entertainment center including wet bar, refrigerator and LED TV, New 32" LED TV's front and back, Sleep Number Queen Bed, Splendide Washer/Dryer, KVH In-Motion satellite antenna DirecTV ready. Maintenance: Maintenance always performed by Freightliner factory Service Center, Freightliner Dealers and/or Cummins Dealers. Complete records. Tires: Michelin XZA 2 Energy, front new DOT 2016, rear DOT 2013. Batteries: 2 Alliance Starter NEW 2016, 4 Trojan T105 House NEW 2014. Extras: Pressure Pro TPMS, Roadmaster Falcon II tow system, Sun Shades front, driver & passenger, 50 amp SurgeGuard, Adco tire covers, much more. Over $4,500 value included in the price.